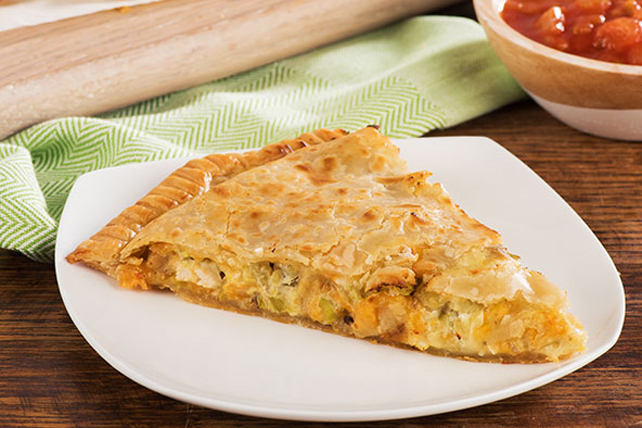 Spice things up a bit with this Grande Green Chile & Chicken Empanada dish. Learn how to make crispy, flavourful empanadas that everyone will love! Mix cream cheese and chilies in medium bowl until blended. Add chicken, shredded cheese and onions; mix well. Unroll pie crust; place on parchment-covered baking sheet. Spoon chicken mixture onto half the crust; spread to within 1 inch of edge. Brush edge lightly with 1 tsp. milk. Fold crust in half; seal edges with fork. Brush top with remaining milk.